This was a temporary visitor here in Vermont-passing through during migration. I was happy be host and provider for a few days. Processed in Topaz Impression with additions. Please click for a better vview. A beautiful snow-painting, Cindy! The texture in the snow is just right, and I love how you framed the the sparrow with the isolated grass stems. A lovely, artistic image! I love how you used your tools to simplify the image, bringing focus to the bird. 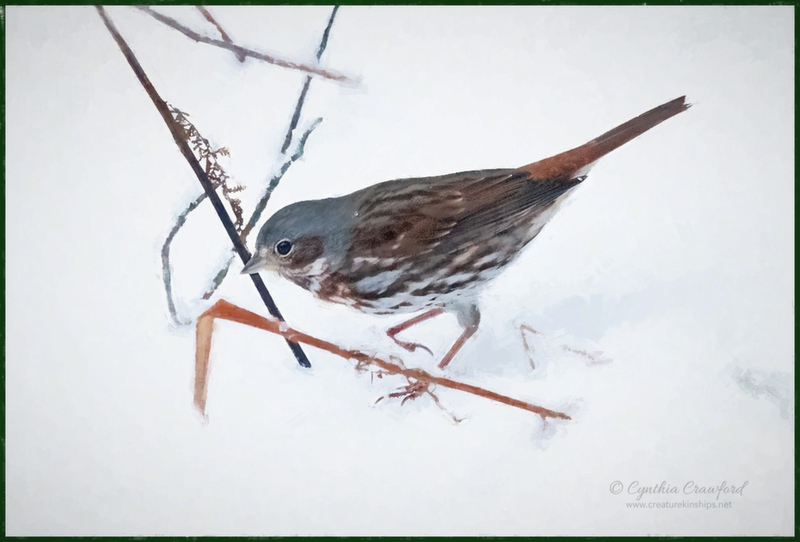 The image overall has nice oriental look, given the simple lines and angles of the grasses & stems, and their colors do a nice job of enhancing the sparrow's winter plumage. Beautiful! Thank you for your very thoughtful reply! Very like an oriental water colour. Beautifully done and when clicked on for the larger view, it really shows how well the colours of the dried grasses complement the sparrow plumage. Quite lovely, Cindy.